I love this time of year. The world is at its complete opposite – the longest day here in the northern hemisphere, the shortest day in the south. The light days warming the days for breeders in the north, while those in the south plan their dreams for the year ahead. For me, this is the time of year when magic happens – either through the fruition of dreams laid long ago in winter days, or as you weave together your plans for the coming months and years, the next generation. That is, of course, the magic that comes with being a breeder. So many have long-term visions and goals, dreams that go way beyond the next generation. In their mind’s eye, they have three, four or even five generations; improve this here, add a bit of that there… Breeding is the perfect combination of science and art; there is a sentence in The Breeders’ Interview in this edition that encompasses that perfectly – when deciding what ‘look’ you want to breed, you choose the paintbrush that you are going to ‘paint with’. What a wonderful description and, as you see generation after generation come to life, one that is truly apt. 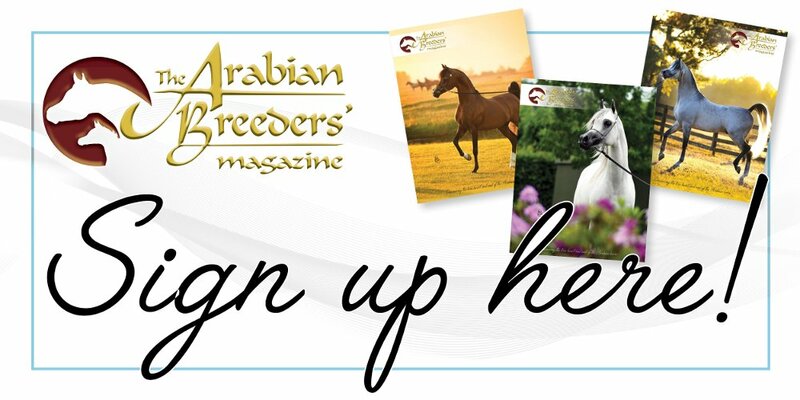 Since the last edition of The Arabian Breeders’ Magazine, I have been lucky enough to visit one of the top straight Egyptian breeding farms in the world – Kehilan Arabians in the US. There, the Rogers family have chosen their lines with care, adding what was needed, ensuring that each generation built on what had gone before – layering the colours from the brush, if you like. The results of this dedication are incredible. I was truly astounded to see such consistency across all the different families at the farm, as well as some traits that are so hard to find now in the show-ring – that of powerful hocks that truly get under the horse and result in breath-taking movement. It was truly phenomenal. As ever, the discussion around showing and breeding remains an interesting one, and one that has resulted in some interesting answers within The Breeders’ Interview. But when you are confronted so clearly with such classic Arabian traits that are undoubtedly lacking in the ‘modern Arabian show horse’, we do need to question the direction the Arabian showing world is going in once more, not just the narrow gene pool that people choose to breed from. Thankfully, there are still preservation breeders, ensuring that certain bloodlines are kept for generations to come. Al Jabal Arabians in Switzerland is one such example, and my visit there in March was very special. Maya Jones’ vision to focus on the Abayyan Um Jurays line has resulted in some beautiful Arabian horses. Hers is a story to follow, with each passing generation. I think, ultimately, there is much to learn from breeders who have been in the world of the Arabian horse for many equine generations. It is only by talking with them, and by their sharing experiences, that we can learn: learn what traits take longer to breed out, or in; learn how to selectively breed for a chosen look or line; learn the benefits, and risks, of linebreeding; and learn how to truly ‘see’ the Arabian horse. This year sees the UK Arab Horse Society celebrate its Centenary, and there has been a wealth of information learned during that time. There are a great many breeders with knowledge that goes back to the heyday of the Arabian horse in the UK, and other, countries. Maybe it is time we picked up the phone, made a visit, and learned as much as we can to input into the next generation – both equine and human. Cover horse: QR Marc (Marwan Al Shaqab x Swete Dreams), owned by Knocke Arabians, Belgium, and photographed by Stuart Vesty. Not a subscriber? Sign up in The Arabian Magazine Shop.